We have exported our Instruments to More Than 32 Countries like USA, Colombia, UK, Belarus, Czech Republic, Germany, Italy, Poland, Romania, Spain, Switzerland, Turkey, Congo, Ghana, Saudi Arabia, Morocco, Zimbabwe, Bangladesh, Iran, Nepal, Pakistan, South Korea, China, Malta, etc. 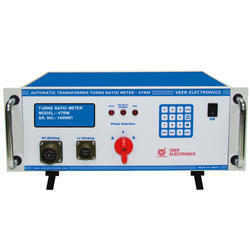 Accuracy ± 0.1% for Voltage & Ratio Measurement for effective Range. Weight of Instrument 5.00 kg Approx. Engineering Colleges to aware students about Turn Ratio & it’s measuring principles. Electricity Distribution & Transmission Companies to enhance their in house testing at micro Level. Fuse with Fuse Blown LED Indication as well as Range Overload Tripping should be provided.